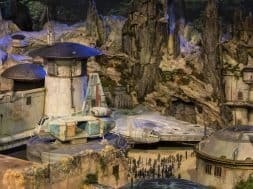 Star Wars Land’s secret interactivity revealed? 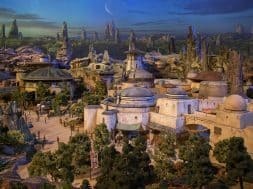 The big, detailed nature of Star Wars Land has been well documented in the two years since the project was officially announced – it’s 14 acres in size, it’ll feature tons of hidden details and Easter eggs, and, we saw just last night, it’ll have multi-story-tall buildings that will dominate guests as they walk down the ancient alien streets (not unlike Universal’s The Wizarding World of Harry Potter – Diagon Alley, we should point out). 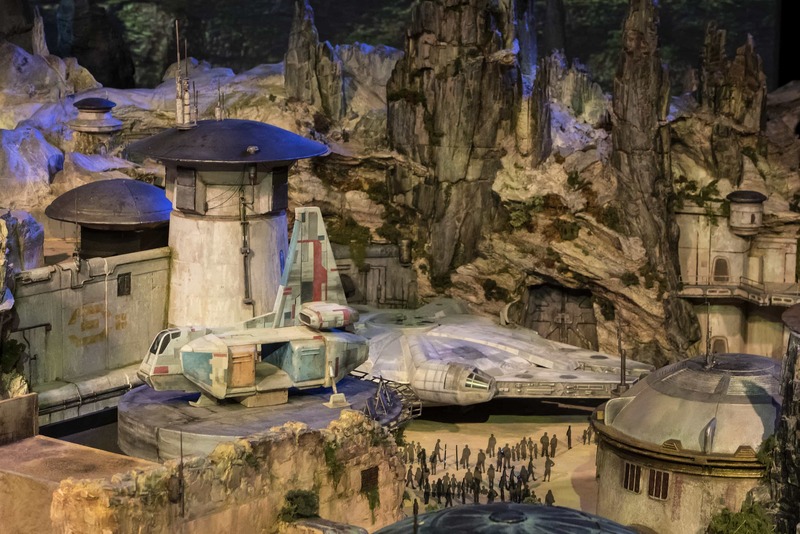 What’s been left wide open, however, is how the land’s customization is going to work; we already knew that riders might be treated differently depending upon how well they flew the famed Millennium Falcon in its own E-ticket attraction, for example, or that visitors would somehow be able to choose the light or dark side of the Force, but the actual mechanics of that process have been left completely mysterious. 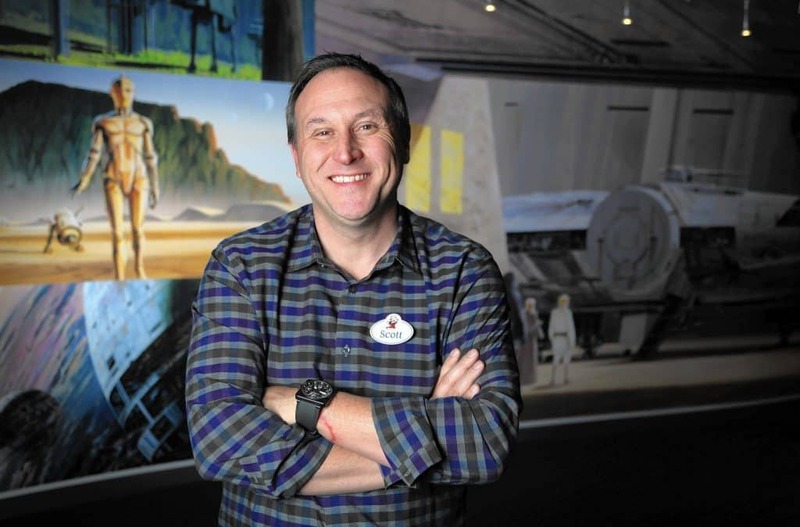 As part of this weekend’s D23 Expo being held in Anaheim, California, Inside the Magic was able to sit down and chat with Scott Trowbridge, the lead Imagineer on the Star Wars Land project. He specifically mentions the usage of galactic credits, the Star Wars mythos’s currency, as one method – but not, perhaps, the sole one – of tracking the area’s customization for each individual user. If you do a great job flying the Millennium Falcon, you might find a few more galactic credits coming your way. But if you bang the ship up and bring it back all damaged […] when you roll across the street to the local cantina, you might hear from someone in the cantina that there’s even a bounty on your head because you owe more money than you have. 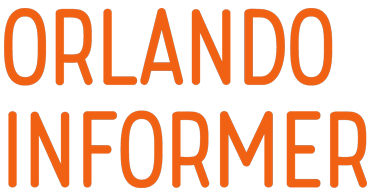 This is both an ingenuous and completely straightforward way of managing how your personalized experiences with the land’s denizens will play out. Have lots of credits in your bank account? Bounty hunters may be more likely to approach you and chat you up, hoping to get some of those funds for themselves. Owe lots of money to various agents or agencies? The inhabitants may be more likely to ignore you – or, even worse, turn you in. 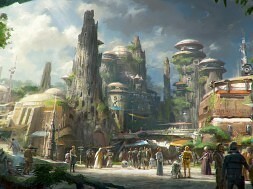 It also, of course, opens up lots of further possibilities for how guests may be able to spend their time while on Star Wars Land’s alien planet: those dreaded midway games that cost real dollars might net you extra credits as well as stuffed-animal prizes; the ability to earn extra coin while on at least one of the rides infinitely extends its repeatability; and there’s even the possibility of seeing a Star Wars version of Diagon Alley’s Gringotts Money Exchange, wherein guests can directly exchange real money for the virtual kind. Obviously, not every visitor to this outpost planet will want to engage in this level of interaction, and Trowbridge stresses that it’s merely an extra layer of content that can be taken advantage of if desired – and ignored if not. 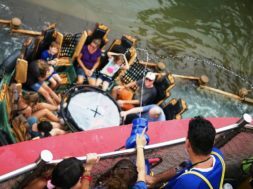 He says that, while there is “an invitation in various ways to be a deeper part of the story,” guests can “also kick back and relax in this land” instead. 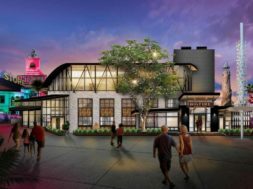 We’re hoping to hear even more about Disney Parks and Resort’s largest expansion yet in its 62-year history very, very soon. 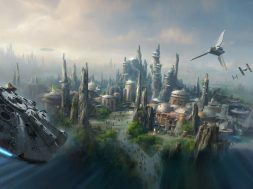 In the meantime, be sure to hit up our complete guide on Star Wars Land for everything we know already. 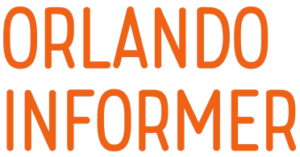 For even more from D23, follow Orlando Informer on Facebook, Twitter, and Instagram. next Is this the REAL name of Star Wars Land?